Welcome back from Spring break! We hope you and your students had a nice week and are ready to return back to finish up the year. The rest of the year will be busy -- there is a lot to keep track of and we will have requests for help. We will do our best to gather and get you the the information, so please try to read each week. Spring has sprung and so has the pollen. Yep, it’s Allergy season which brings running noses and sneezing. Please consider sending in more tissues! Your teachers will thank you. Middle School math packets were sent out before break. Click here for online form and read below for more details. Spring YouthNet for most classes should begin this week, announcements will be made at school. The 7th Grade field trip to Turtleback Zoo! We need chaperones. A great opportunity to check out the zoo animals and hang with your middle schooler. What: We are looking for 15 chaperones for the trip. Details: Chaperones are asked to arrive at Maplewood Middle School between 9 and 9:15 am and will ride on the buses with students to and from the zoo. The buses will arrive back at Maplewood Middle School by 2:30 pm. Please sign up if you are interested and able (you may have to pay for your admission to the Zoo unless of course you have a family membership). You will select a math course for your child for the 2019-2020 school year. The chart in the link shows the courses available at each grade level. The letter mailed home contains information about each course and your child's math performance. 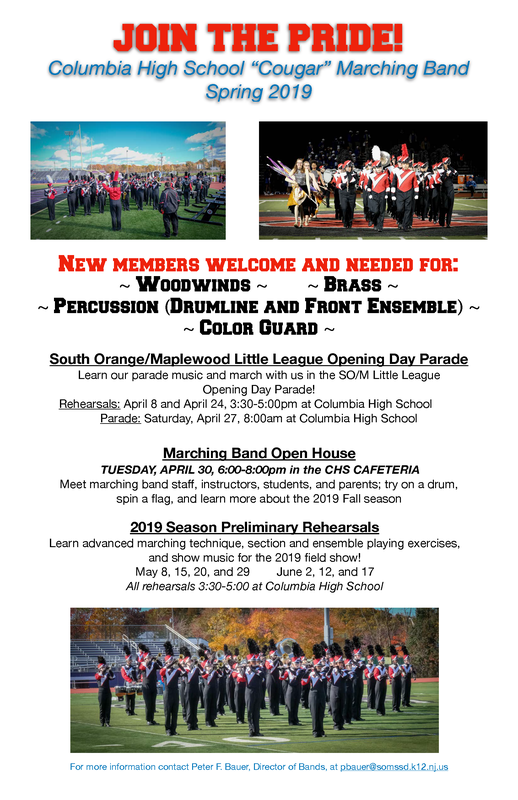 Join the Columbia High School Marching Band! 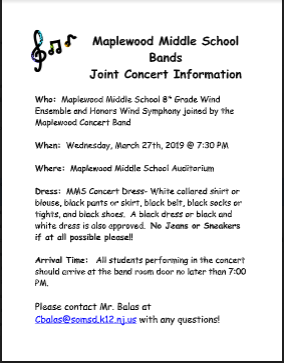 For the first time ever, 8th grade students will have the opportunity to experience the band while still in Middle School! Please see the attached flyer for more information and details. It’s a great opportunity! 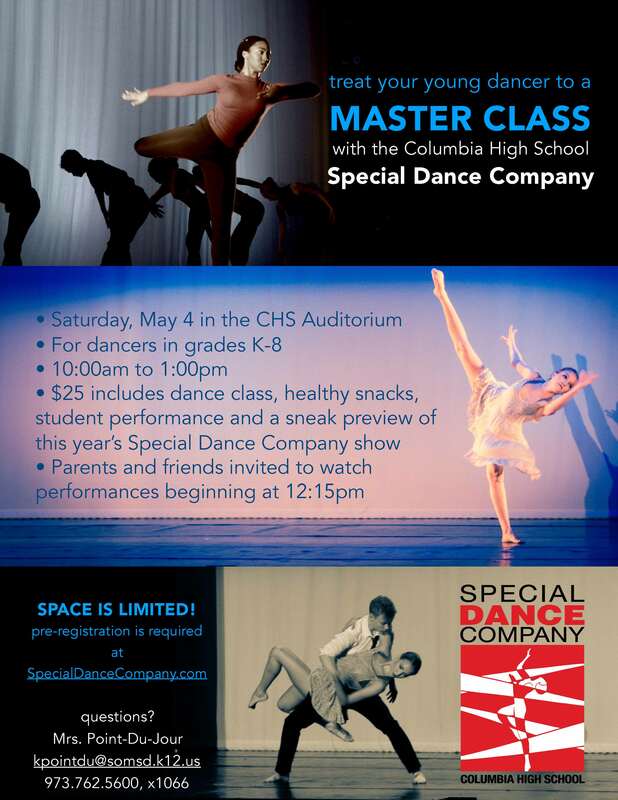 Have your dancer join in the Special Dance Company for a day of dance. Your K-8th grader will experience first-hand what it’s like to be a part of this amazing group. Please see attached flyer for info! Spring YouthNet begins! Some classes may still have availability. Click HERE for more information. Still Room! Special Wednesday Offering Curls on the Move with Ms. Graham. Curls on the Move (COTM) is a hair, health, and self-care curriculum specifically for adolescent girls of African Descent, but all are welcome. Hands-on learning opportunities, self-esteem building, physical activities and more... See Ms. Graham in Room 153 for more information and registration. Cost is $40 for the spring session. Please see the attached sheet for important information regarding seasonal allergies. Click HERE for the flyer. School Supplies - Kids in Need! Pencils or notebooks lying around? PLEASE DONATE IF YOU CAN! As we enter the final semester of the year, teachers and students could use some extra supplies. Please drop off extra notebooks, paper and folders to the grade team leaders or Ms. Miller. 8th grade activities can get expensive -- that’s why we have a Spring Match program for the 8th grade. For every dollar you donate, a group of 8th grade parents will match it up to $500! Please click HERE for a “no frills 8th grade donation” that could raise at least $1,000 for our 8th graders in need! ALSO, If anyone would like to host an 8th grade fundraiser, we would be most grateful. Last year some families raised significant funds with a small event. “Kids who get testing accommodations through an IEP or a 504 plan can often get the same accommodations on the ACT & SAT. For 8th grade families to keep in mind for future AP, ACT & SAT testing. 9th graders who want to take the AP World History test next year & will need accommodations, should start the process early next Fall because it can take a few months to set up: at CHS, contact Mr Matt Endlich (mendlich@somsd.k12.nj.us) for assistance with obtaining testing accommodations. Students with an IEP or 504 Plan may receive test accommodations if they have been approved by the College Board for SAT, SAT Subject tests, PSAT/NMSQT, PSAT 10 & AP Exams . See more details on requirements at the College Board website: https://www.collegeboard.org/students-with-disabilities. April 8 Special Siblings 4:00-5:30 PM Youth led support group, with Laura Reichgut LCW, for siblings (Grades 5-8) of people with special needs, drop off, snacks provided. Please click HERE for April’s Digital Backpack featuring information from around our two towns! We have had another busy week at MMS with author visits and assemblies. Please ask your MMS students about the special things they experienced at school this week! A special thank you to our Cultural Arts Chairs Tracey Clark and Rachel Fisher, and Library Media Specialist Evyn Degnan for planning these amazing events for our kids! A reminder that this is the last full week of school before Spring Break -- there is no school the week of April 15 - 19. We’ll see you back at MMS on Monday, April 22! Spring YouthNet brochures and permission slips are now available! On Thursday MMS hosted current 5th graders who will join MMS next year as the new class of 6th graders! It was a great night and I know that the parents and kids are excited to join our MMS community. Thanks to everyone who made them feel so welcome! A very special thank you to the many MMS parents who have volunteered to be a part of the MMS HSA for the 2019-2020 school year -- the Board is full and we are thrilled with the great group of parents who are going to lead the MMS HSA next year. You’ll be in great hands! Spring YouthNet brochures and permission slips are now available! Please see the link below to sign up. Monday, April 1 - Well-wishers orders for yearbook due!! Monday, April 1 Well-wishers orders for yearbook due - last day! Author Visits to MMS - Get Excited!!! On Thursday, April 4, Newberry Award-winning author Kwame Alexander is coming to MMS! This is a very special opportunity for our kids. Books are available for sale so please take a moment to purchase one and get an autograph from Kwame! Spring YouthNet is here! Please take a look at what is on offer for Spring and take a moment to sign up -- lots of fun opportunities! Click HERE for more information. Yep, it is us again, asking you to join the MMS HSA. We have been busy trying to fill the slate of positions for next year’s board, but still need some volunteers. If you’ve been on the fence, please reach out - we are happy to answer any questions you may have.The MMS HSA is a great way to get involved in the school and know what’s happening. Middle School is different, but the kids and school still need our support. It’s a great group of parents and the commitment is not overwhelming! If you or anyone else you know wants to get involved, please reach out! debcatholt@gmail.com or szknutsen@gmail.com. Last week we saw the hard work of MMS HSA support in action with two wonderful events. A spectacular performance for our 6th and 8th graders from the Nai-Ni Chen dance company performed Red Firecrackers: The Legend of the First Chinese New Year. Check out MMS 6th graders defeating Nian the monster in dance! (click here to watch 3 min video). The Village Green also covered the Grand Opening of the Maplewood Middle School Maker Space. Thanks to the hard work of parent volunteer Richard Marks, Media Specialist Evyn Degnan, Principal Dara Gronau, the Achieve Foundation and your MMS HSA. Click here to read more about how parent and schools can work together for the benefit of our school community. Wednesday, March 20 - Author Visit to MMS - Mark Aronson! On March 20, Maplewood resident Mark Aronson will be visiting MMS to speak to our 7th graders about his book Rising Water: The Story of the Thai Cave Rescue. On April 4, Newberry Award-winning author will be visiting MMS with Kip Wilson as a part of his Versify Tour! A special thanks to Library Media Specialist Evyn Degnan for organizing. Please click HERE for more information and to purchase BOOKS! Pencils or notebooks lying around? PLEASE DONATE IF YOU CAN! As we enter the final semester of the year, teachers and students could use some extra supplies. Please drop off extra notebooks, paper and folders to the grade teamleaders. We are looking for an HSA Special Ed Representative for next year’s board. If you are interested, please contact Kiersten Carlson-Williams at lissenden@verizon.net. March 18 Special Siblings 4:00-5:30 PM Youth led support group, with Laura Reichgut LCW, for siblings (Grades 5-8) of people with special needs, drop off, snacks provided. 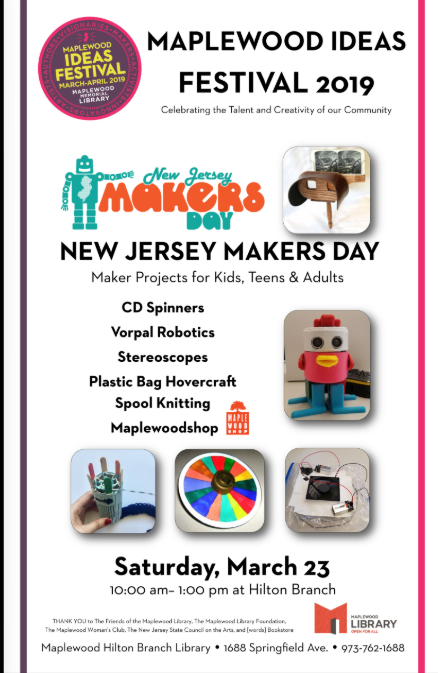 Mark your calendar for Saturday March 23rd for the NJ Makers Day at the Hilton Library Branch from 10am - 1pm. Click here for more information. We hope you had a lovely weekend! Thank you so much to our parents and volunteers who made the 8th grade mixer with SOMS such a success - especially our 8th grade coordinators Thea Cogan-Drew and Adrianna Donat! A great time was had by all! Thank you so much to all of you who’ve reached out and volunteered to be a part of the 2019-2020 MMS HSA! We are still looking to fill some roles, so if you’ve been on the fence, please reach out - we are happy to answer any questions you may have.The MMS HSA is a great way to get involved in the school and know what’s happening. It’s a great group of parents and the commitment is not overwhelming! If you or anyone else you know wants to get involved, please reach out! debcatholt@gmail.comor szknutsen@gmail.com. A Special Visit to MMS from Kwame Alexander! Please click here for a link to this month’s Digital Backpack -- lots of great information and resources on what’s happening for kids in our community! Happy March! We hope you are enjoying the snow this weekend! Even though we are getting winter weather, your HSA is gearing up for several spring events for you and your kids! The MMS HSA is a great way to get involved in the school and know what’s happening. Our HSA is a great group of parents and the commitment is not overwhelming! If you or anyone else you know wants to get involved, please reach out! debcatholt@gmail.com or szknutsen@gmail.com. Attention 8th grade families: The CHS HSA needs you! The CHS HSA is beginning the process of filling out our slate of executive board and committee positions for the 2019-20 school year. If you would like to volunteer to serve on the board, please contact us at hsa@columbiahsa.org. Volunteering is a great way to be involved and learn more about CHS happenings. Click here to view the list of board positions. Thank you! Monday, March 4th at 7 p.m. 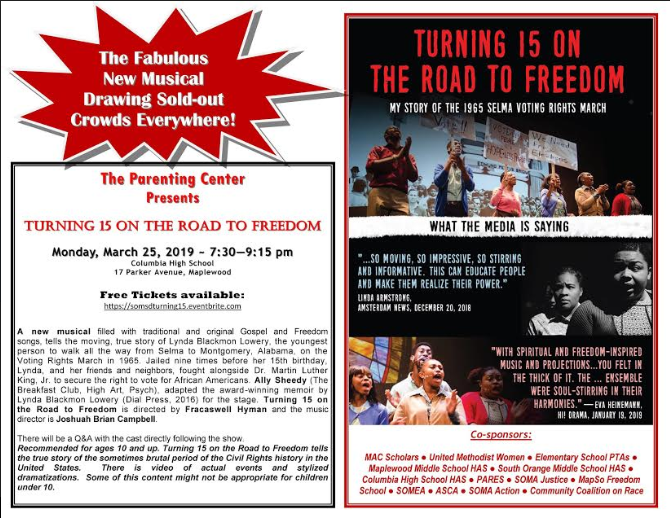 Please see the invitation to an event at Oak Knoll School, please share with your respective pediatricians and other parents who may learn from this event. It’s intent is to help inform everyone on Eating Disorders which are much more common and severe than many understand. With it having the highest mortality rate of all mental illnesses, we all have a lot to learn to protect our children. Congratulations to the amazing cast and crew of the MMS Musical, “The Wizard of Oz!” for a performance packed weekend. We could not be more proud of everyone and thank those who attended and showed their support. Speaking of proud, Principal Gronau wants to know if your student is a standout outside of school! Each month building administrators can nominate students from their school for acknowledgement of achievement at the monthly BOE meetings. We know there must be MMS Students worthy of praise. Please email Principal Gronau dgronau@somsd.k12.nj.us directly if you have something to share. The MMS HSA Needs you next year! We are forming the nominating committee now for the board nominations of the 2019/2020 MMS HSA PTA. Please consider helping out. If you know any new families entering MMS next year, the MMS HSA is a great way to get comfortable with the school. As we all know well, our students still really need us in Middle School. If you have any questions about the President roles, or the other roles available, please reach out to us! debcatholt@gmail.com or szknutsen@gmail.com. You should have received an email last week with key dates. If you did not receive, it please check your inboxes or SPAM. Volunteer for food items or to Chaperone HERE. The Permission Slip is HERE. Please email Adrianna or Thea if you are interested in helping sell tickets during lunch March 4-7. We are so excited that our plans to beautify the MMS bathrooms are finally going to get underway! On Saturday, March 2nd, a group of staff from MMS will be painting and beautifying many of the bathrooms in the school. If you or your kids are interested in volunteering, please let us know. More details to come. Thank you! 8th Grade If anyone would like to host an 8th grade fundraiser, we would be most grateful. Last year some families raised significant funds with a small event. OR - you can donate directly to the 8th grade fund HERE. Achieve - Mardi Gras in SOMA! Please join our community members as we kick off Achieve Fundraising and celebrate our public schools! Join us for a Mardi Gras soiree hosted by the Achieve Foundation - Friday, March 1 from 7 - 11 pm at The Woodland. Please click here for more information and to purchase tickets. Hope to see you there! SEPAC’s next monthly meeting is for you! The topic: Special Education Experience: The Secondary Years! Moderated discussion lead by SEPAC’s veteran secondary liaisons. Insights from the administration of the Special Services Department. Topics to be addressed: transition from elementary school to middle school and middle school to high school, academic programs, reading interventions, executive function supports, and more. General sharing, support and networking. SEPAC strives to bring together members of the special education community with similar questions, issues and concerns in the same room at the same time. Monday, March 4th at 7 p.m. 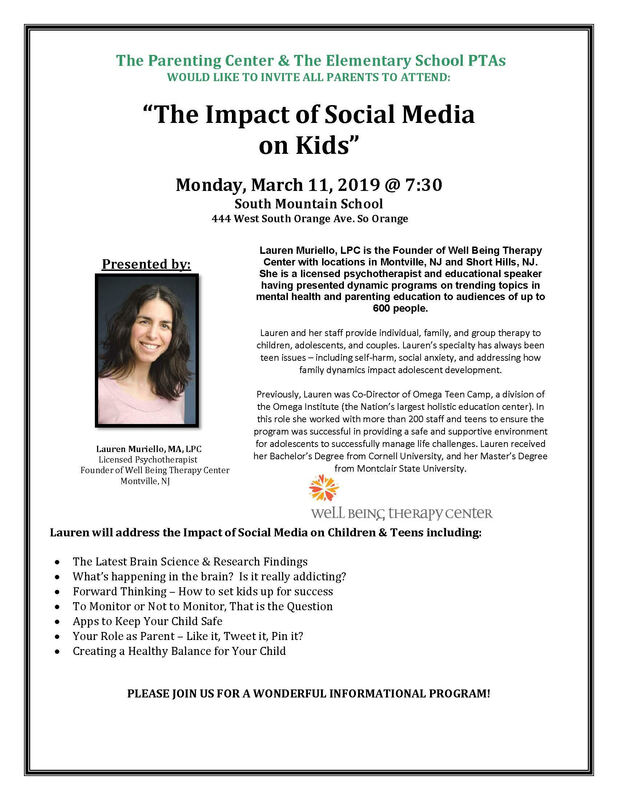 Please see the invitation HERE to an event at Oak Knoll School, please share with your respective pediatricians and other parents who may learn from this event. It’s intent is to help inform everyone on Eating Disorders which are much more common and severe than many understand. With it having the highest mortality rate of all mental illnesses, we all have a lot to learn to protect our children. We hope that you are enjoying your long weekend! A reminder that there will be no school this Monday and Tuesday in observance of Presidents’ Day. This blast has a lot of information so please take a look and contact us with any questions! Follow the Yellow Brick Road! This weekend sees the premiere of the much-anticipated MMS Musical, “Wizard of Oz!” Tickets are still available so please click on the link below to purchase. It’s sure to be a wonderful time! *We definitely need volunteers interested in serving on the MMS HSA PTA next year. We have had a great time serving as your MMS co-Presidents the last two years but our by-laws mandate that we move on. Please consider helping out. Our students still need us in Middle School. If you have any questions about the President roles, or the other roles available, please reach out to us! debcatholt@gmail.com or szknutsen@gmail.com. *The shows will sell out, so don't wait! 1) Purchase your tickets online via the MMS Musical Website! 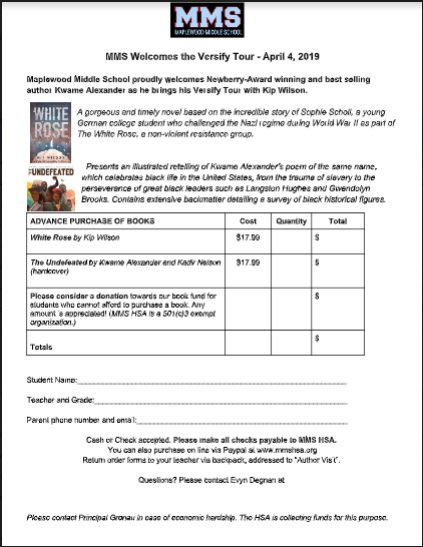 1a) Send your student to pick up an order form from the MMS Main Office! Thursday, March 7 MMS/SOMS 8th Grade Mixer in the CHS Cafeteria, 7-9 pm Volunteer for food items or to Chaperone HERE. The Permission Slip is HERE. Please email Adrianna or Thea if you are interested in helping sell tickets during lunch March 4-7. Attention 8th grade families: The CHS HSA needs you! The CHS HSA is beginning the process of filling out our slate of executive board and committee positions for the 2019-20 school year. If you would like to volunteer to serve on the board, please contact us at hsa@columbiahsa.org. Volunteering is a great way to be involved and learn more about CHS happenings. Click here to view the list of board positions. Thank you! We are so excited that our plans to beautify the MMS bathrooms are finally going to get underway! On Saturday , March 2 a group of staff from MMS a will be painting and beautifying many of the bathrooms in the school. If you or your kids are interested in volunteering, please let us know. More details to come. Thank you! If anyone would like to host an 8th grade fundraiser, we would be most grateful. Last year some families raised significant funds with a small event. OR - you can donate directly to the 8th grade fund HERE. Please join our community members as we kick off Achieve Fundraising and celebrate our public schools! Join us for a Mardi Gras soiree hosted by the Achieve Foundation - Friday, March 1 from 7 - 11 pm at The Woodland. Please click here for more information and to purchase tickets. Hope to see you there! Thank you to organizer Dana Cavanaugh and all the families who donated Tissues and Healthy Kid Supplies over the last few weeks. There are enough tissues in the building, for now, and the students and staff can hopefully fight those germs with some real impact. It was wonderful to see the quickness of a grassroots drive. It certainly takes a village. We would like to also highlight that this Friday at MMS, the 3rd Annual Table Tennis Tournament will take place in the afternoon. In honor of Black History Month, the MMS MLKA is performing a step show and Ms. Bradshaw and the select chorus and all choral students will sing "Lift Ev'ry Voice and Sing." It should be beautiful. The 8th grade sells pretzels and drinks as a fundraiser for the 8th grade activities. If you would like to help, please contact Your MMS HSA 8th Grade Coordinators, Adrianna Donat adrianna.donat@gmail.com, Thea Cogan-Drew theacogandrew@gmail.com. We definitely need volunteers interested in serving on the MMS HSA PTA next year. We have had a great time serving as your MMS co-Presidents the last two years but our by-laws mandate that we move on. Please consider helping out. Our students still need us in Middle School. If you have any questions about the President roles, or the other roles available, please reach out to us! debcatholt@gmail.com or szknutsen@gmail.com. Friday, February 15 Table Tennis Competition - Pretzels for Sale! are interested in helping sell tickets during lunch March 4-7. Follow the Yellow Brick Road - Maplewood Middle School presents The Wizard of Oz! 1) Are you a talented builder who could help us finish up our projects? Cast and Crew Members - Please check your emails! 1) Cast and crew member families should have received "MMS Musical - Reminders #2" on Sunday, 1/27 via email with the emails used to sign up for the musical. 1a) If you did NOT receive the email, please reach out to Ms. O'Sullivan mosulliv@somsd.k12.nj.us ASAP as we are sending out crucial information for the start of full cast and crew rehearsals! FEBRUARY SEPAC MEETING: Special Education Experience: The Secondary Years! 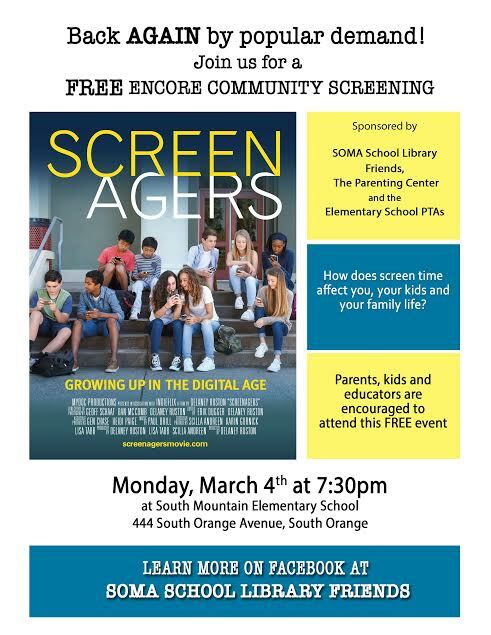 Middle School and High School parents and guardians (and any 5th grade parents who are thinking ahead) SEPAC’s next monthly meeting is for you!